Delighted to be part of a new pet-only challenge blog - A True Friend, A Priceless Treasure is the perfect excuse (as if I need one) to do more pages with my gorgeous girls! The other girls have produced some fantastic work and it's great to see some really unusual pets too! 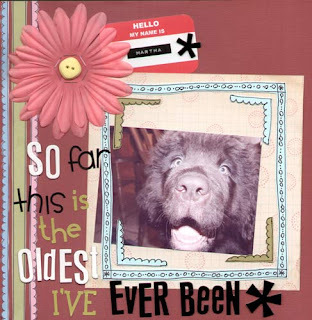 I've used yummy yum BG - Perhaps, Prima Flowers, Heidi Swapp and Fancy Pants chipboard, Doodlebug alpha stickers and Papermania brads. I was printing some pics for the Cyber Crop on UKS last night and this was one of my favourites. Katy needs a pony! - I've got massive doggies - does that count? Katy needs every ounce of her courage - At the moment... oh yes! Katy needs a new liver - Oi!!! I don't drink that much! - Do I? Katy needs check up’s less frequently - Thank god! Katy needs your help - Or needs help... fullstop? Katy needs significant. attention before pricing - Wha!!? Katy needs: to get home, and get home soon - It's Friday! Damn right! Katy needs an assistant - Have I mentioned this?? Katy needs to wear a ball gown - I really don't... although it might be good preparation for Emma's wedding!!! katy needs a skatepark - Not sure what i'd do with one? Rent it out for an extortionate fee? Now good news!! I was thrilled to be one of the winners of a Tee from the Effer Dare last week! I never win anything so am a little bit excited! Hurrah! I've finally gotten round to doing one of the Effer Dares The challenge of using a T-shirt slogan was too much to resist! As you may or may not know I'm a little bit obsessed with Threadless T-Shirts and have quite a collection, so that was my first stop to find something suitable. 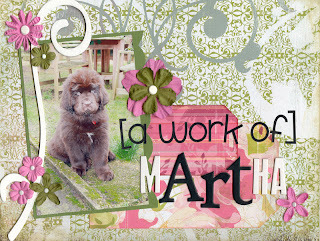 I thought it was quite fun to use a fun pic of Martha. Because every single day is her oldest! By the way... Martha is now 13weeks and weighs 45lbs!! !